Published: Nov. 25, 2012 at 11:37 p.m. Need to improve your fantasy football roster? NFL.com has you covered! Each week, we'll offer up the 10 players you need to target off the waiver wire in that never-ending quest for a fantasy league championship. The number listed in parenthesis next to the player's name is the percentage of NFL.com leagues that he is still available as a free agent. Remember how much I liked Tim Tebow last season? Well, I like Kaepernick even more. Not only does he have a great arm, but the Nevada product can also make plays (and score fantasy points) with his feet as well. 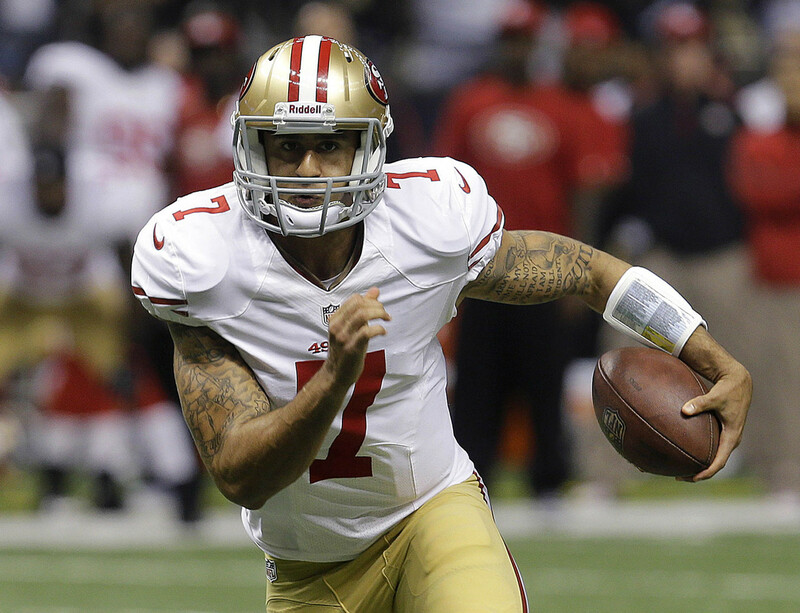 Mark my words ... Kaepernick will help lead a lot of fantasy leaguers to a postseason berth. Coach John Fox pulled his own form of Shanahanigans in Week 12, as Moreno (not Ronnie Hillman) started and saw most of the backfield touches. He rushed for 85 yards on 20 carries and posted four catches for 26 yards in a win over the Kansas City Chiefs. Moreno now needs to be added in most fantasy leagues. Shorts has been on fire in recent weeks, scoring 14-plus fantasy points in three straight games. He's gone over 100 yards in two of those contests and has scored one touchdown per contest. With nice matchups against the Buffalo Bills and Miami Dolphins upcoming, Shorts now needs to be owned in all formats. Blackmon looked like a complete fantasy bust for all intents and purposes, at least until Chad Henne took over the reins of the offense. Since then, the Oklahoma State product has put up a ridiculous 298 yards and two touchdowns in his last two games. Blackmon could be a real asset in the fantasy playoffs. Garcon put up a solid stat line on Thanksgiving with 93 yards, one touchdown and 15.30 fantasy points. More important, he looked to be closer to 100 percent recovered from a nagging foot ailment. If he's been dropped in your league after an extended absence, now is the right time to target Garcon. Wells returned to action with a bang, scoring a pair of touchdowns in his first game since Week 3. While he does face some tough opponents down the stretch, Wells remains a viable flex option in some leagues because of his nose for the end zone. He's scored a combined 12 touchdowns in his last 18 contests. Hilton has been an absolute touchdown machine, finding the end zone five times in his last four games (including a punt return for a score against the Buffalo Bills). With attractive matchups against the Lions and Tennessee Titans coming up next, the rookie is clearly well worth a look in most fantasy formats. With Nate Burleson done for the season and Titus Young in the doghouse, Broyles now has fantasy appeal in some leagues. He put up a great stat line against the Houston Texans with six catches, 126 yards and 12.6 fantasy points. This week's matchup against the Indianapolis Colts is another reason to add the rookie. Edelman was seeing more time in two wide-receiver sets in Week 11, and now he's more involved in the offense with Rob Gronkowski lost for several weeks. That was evident against the Lions, as he posted 64 yards and scored one offensive touchdown. As long as he's healthy, Edelman is well worth a look right now. Fantasy owners in deeper leagues who need a wideout should consider Sanu, who has quietly been putting up some nice fantasy totals in recent weeks. He's scored at least one touchdown in each of his last three games, including two in a win over the Oakland Raiders, and is averaging double digits in that time.